This weapon's two-handed light swings consume sixty stamina each. 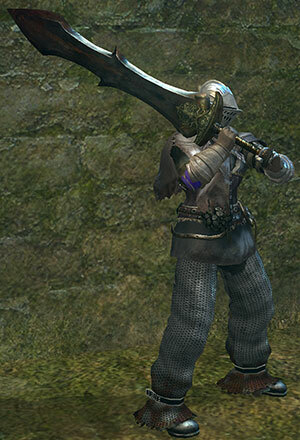 Like all Black Knight weapons, it deals extra damage to demon enemies, such as Taurus Demons and Capra Demons. In the German version of the game, this sword has a completely different name: "Schwert des Drachentöters", which translates to "Sword of the Dragon Slayer", whereas the normal Black Knight Sword is called "Schwarz-Ritter Großschwert", which translates to "Black Knight Greatsword". In the French version of the game, this sword is called "Espadon tueur de dragons", which means "Dragon Killing Zweihänder". In the Italian version of the game, this sword is called "Ammazzadraghi", which means "Dragon Slayer". This, along with the sword's German and French names mentioned above, likely references the massive "Dragonslayer" sword used by Guts, the main character of the manga Berserk. The non-respawning Black Knight in the Undead Parish is not guaranteed to drop the sword. Ignore the knight at first, and get the Covetous Gold Serpent Ring from Sen's Fortress, then leave (or continue on to Anor Londo to teleport between bonfires), go back to the Undead Parish, and have at least 10 soft Humanity with the ring equipped before killing the knight. This will increase the chances of getting a drop. 90% STR, 5% DEX scaling.